The Canadian Food Inspection Agency (CFIA) published revised draft transport regulations in December 2016. The new regulations were published in February 2019. The new regulations "fall well short of our animal welfare caucus and veterinary expert recommendations, and fall well short of international standards that better protect animals." The new laws allow animals to continue to be transported for very long periods of time without food, rest or water. For instance, veterinary recommendations stipulate a 12-hour travel limit for laying hens. 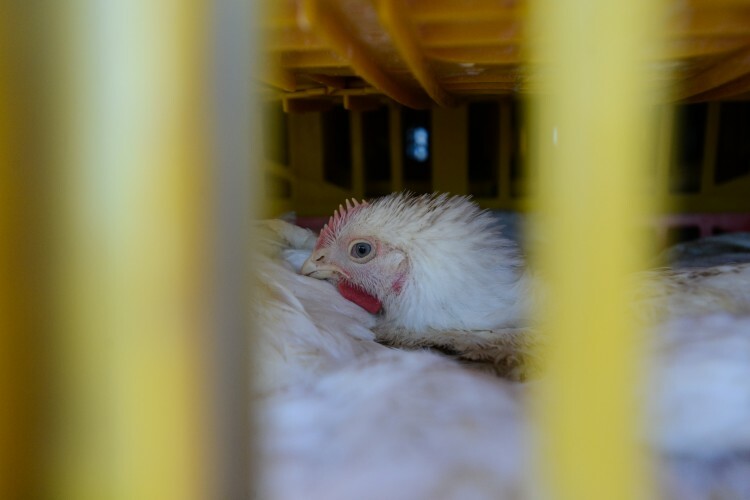 Still, the new laws allow laying hens to be transported for up to 28 hours without food, rest and water. Farm animals are transported in extreme heat and cold in Canada. The new transportation laws do not require trucks be maintained at a certain temperature or that amenities, such as on-board food, water or fans, be used. The new regulations also allow transporters to continue to use electric prods on farm animals. The Globe and Mail (March 17, 2017) wrote how animal industries lobbied CFIA for longer transport times. CFIA bowed to animal-industry pressure and increased food-water-rest times, ignoring its own science-based analysis. 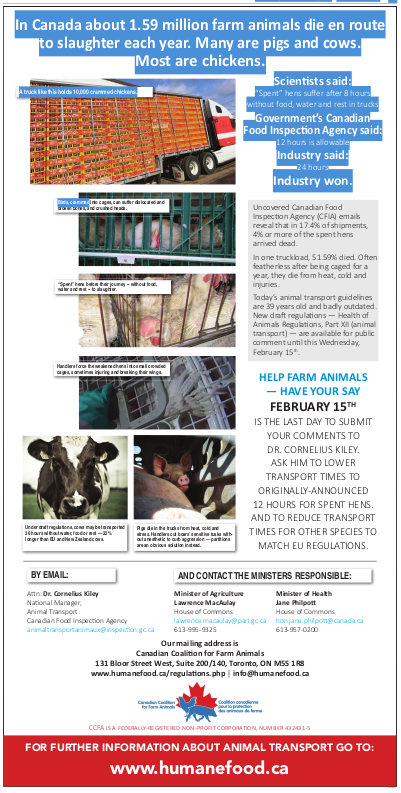 The Globe article was based on documents obtained by the Canadian Coalition for Farm Animals through Access to Information and Privacy legislation. Documents recently obtained through Access to Information requests show the CFIA did very few highway inspections of vehicles transporting animals in 2016 and 2017 and none in Ontario, Manitoba, Quebec, Nova Scotia and Newfoundland. Read the full report. In January 2019, Stephanie Brown from the Canadian Coalition for Farm Animals and Lesley Moffat from Eyes on Animals in Amsterdam visited a Quebec auction market. They saw overcrowded pens, aggressive handlers, slippery floors and terrified animals. Watch the video on YouTube.